Superbly located in the heart of Manchester's vibrant city centre, the Northern Quarter serviced apartments are an ideal hotel alternative for guests seeking both short and long-term rentals in the city. Both Manchester Piccadilly and Manchester Victoria stations are a ten-minute walk away, granting excellent access to the rest of the city and surrounding areas. Guests will benefit from having Manchester's trendy Northern Quarter - the city,s self-styled creative district - on their doorstep, home to some of the best independent coffee shops, boutique shops, and quirky bars. Each exclusive penthouse apartment is fully furnished to a high standard, and designed with comfort and privacy in mind. An open-plan living room featuring a full home entertainment system is an ideal space for relaxing and entertaining. The kitchen is fully fitted with integrated appliances, and the bathroom modern. 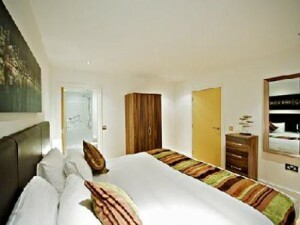 Two beautifully furnished, double bedrooms guarantee guests a comfortable stay. Two additional double sofa beds are available on request to accommodate a further two guests. Complimentary WiFi and a weekly housekeeping service are included for guests' convenience.